Well, today is Saturday and ya'll may think I forgot what that meant, since I haven't been playing in the sketch for a couple of weeks, but I actually had time to stamp this week! 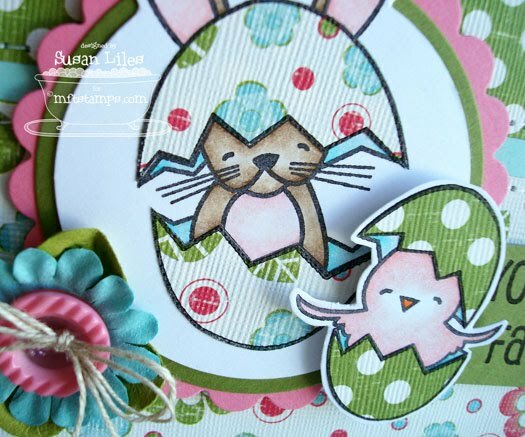 Of course it's time for Jen's Sketch For You To Try! It was a good one to get back into the swing with, too--it's super easy! Audrie: That spells ZO. (As in Joe, as in how I told Melissa, "it's not like anyone will pronounce it JOE!" Um, yeah, no one but MY daughter!) So now, Abby is insisting it be spelled ZOEY, just to make sure. That is classic 6 year old stuff right there. I was cracking up! Speaking of cracking up, on to my SFYTT card! I used the new set from My Favorite Things, What's Crackin'. Ever since I got this set, those eggs have been "poaching" out to me to paper piece them! So easy! I colored the bunny and chick with my long lost friends, my Prismacolor pencils and OMS. I forgot how much I loved coloring that way! I have a little bit of news about Eric, but I am running LAAAATEE this morning and need to finish this up. I'm hoping to post about it a little later tonight after we go to church. SUSIE Q-TIP: Green Prima Flowers? Yes. Go ahead and get some (I just got a big package of just green ones from Michael's). If anything else, they make great "leaves" for the bottom layer of paper and other Prima flowers. Love the card! Those chicks are adorable! Love your Audrie story too! My neice is Ashlea (Ashley) but MY 6 year old (who is 3 years younger than his cousin) insists on calling her Ash-lee-A because that's how it's spelled! It irritates her to end!!! I opened my google reader and there popped up your wonderful card and I said out loud "OH MY GOSH WHAT A CUTE CARD!" Love how you used your dp with the little chickies..just darling! I'll be checkin' back to see what the update on Eric is!! I love your card--wonderful colors! Simply A-dorable, Susan. I don't know how you continue to crank out something amazing each and every time...YOU are really somethin'!!! Oh yay spring colors!! :) Another cutie, Susan!! 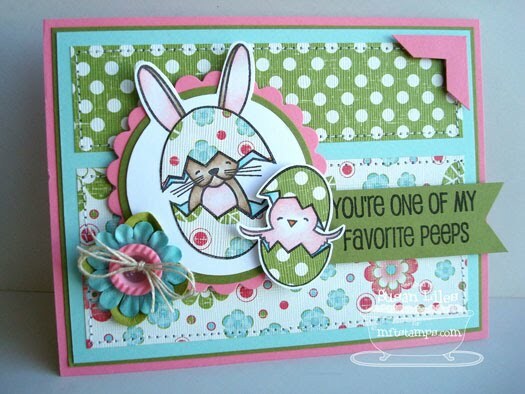 !I especially love the paper pieced eggs and the pink photo corner!! This is so adorable! iL ove it! That is SO beautiful. The BEST card I've seen made with this set, hands down! Hope you're doing ok. HUGS and smooches! Truly adorable card...love the pieced eggs!! And such a cute story! Hope you all are hanging in down there! Know we're all still thinking of you!! FAB card!!! GReat job paper piecing those eggs! !